Lower Back Pain - Book In At Podiatry HQ Clinics Today! — Could Your Lower Back Pain Be A Sign Of Other Conditions? Do you experience lower back pain? A constant ache or sharp pain that doesn’t seem to budge, even with ongoing treatment with your physiotherapist or osteopath? There could be more to your back pain than you think. The back consists of numerous muscles, tendons, bones and nerves that allow different types of movements to occur. More often than not, the feet are overlooked when considering why you may be experiencing lower back pain. Each foot takes up to 5 times your body weight when walking, which means that if your feet are not absorbing the shock or redistributing the pressure, it can cause issues else where in your body. Typically, when walking, if your feet pronate or supinate your body must work harder to accommodate your walking pattern. 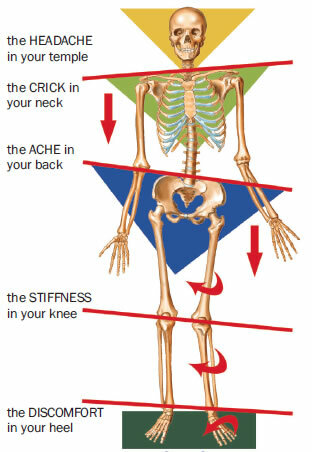 This means that increased pressure goes through your shins, knees, hips and lower back. Those who pronate may also have flat feet in which extra motion occurs though the arches of your feet, causing the muscles in your legs to work harder to allow movement within the foot. It can often be difficult to determine if an acute injury or chronic injury has occurred to your back. Often with acute injuries, you will experience a sharp pain for a short period of time while chronic injuries tend to be a dull and achy. If you have been experiencing lower back pain that is not being resolved with treatment, book in to see one of our skilled podiatrists. We will perform a biomechanical assessment to determine whether your feet are contributing to this problem and ensure you have an appropriate treatment plan for your individual needs.